Equatorial Guinea joined more than 165 countries today as they pledged their commitment to climate change and signed a historic climate change agreement at a ceremony hosted by United Nations Secretary-General Ban Ki-moon. The UN reported that the signing of the agreement is the first step toward ensuring that the agreement enters into force as soon as possible. After signing, countries must take the further national (or domestic) step of accepting or ratifying the agreement. This ceremony has set a record for the most countries to sign an international agreement on one day. Equatorial Guinea’s Minister of Foreign Affairs and Cooperation, Agapito Mba Mokuy, on behalf of President Obiang Nguema Mbasogo signed the agreement, which was reached in Paris in December of 2015. 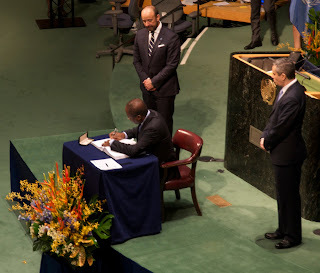 Equatorial Guinea’s Ambassador to the United States, Miguel Ntutumu Evuna Andeme also participated in the ceremony. Equatorial Guinea’s Ministry of Social Affairs and Gender Equality, led by Consuelo Ondo Nzang, recently signed gender equality agreements with the United Nations aimed at empowering women. 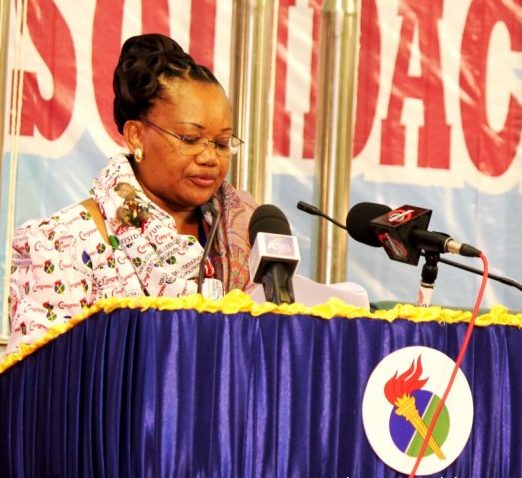 The agreement strengthens the ties between the Equatoguinean Government and the United Nations. Together they will continue to fight for gender equality.